Gilder Lehrman Collection #: GLC00317.02 Author/Creator: Kurz & Allison Place Written: Chicago, Illinois Type: Print Date: 1890 Pagination: 1 print : col. ; 52.8 x 72 cm. Summary of Content: Depicts the 54th Massachusetts Regiment, composed of African American soldiers, leading the charge upon Fort Wagner in Charleston Harbor, South Carolina. One African American soldier carries a United States flag. Lists the names of Union officers involved in the battle, including Generals Quincy Adams Gillmore, George Crockett Strong, and Truman A. Seymour, and Colonels Robert Gould Shaw, John Lyman Chatfield, and Haldimand S. Putnam. Lists the number of Union troops lost as 1200, stating that 300 Confederate soldiers and 16 officers led by Confederate General Pierre Gustave Toutant Beauregard were killed in the battle. 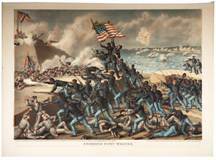 To view a similar print of the Battle of Fort Wagner, created in 1863, refer to GLC02881.23.